Solar road technology has great potential to produce clean electricity and replace power transmission and information infrastructure. Construction of a prototype first 12' by 12' panel has been funded $100,000 by the United States Department of Transport. An overlay electronics strata that contains solar cells, LEDs and supercapacitors which would produce and store electricity while the LEDs would "paint" the surface with light. This layer also holds the microprocessors and communications device that would make highways "intelligent". 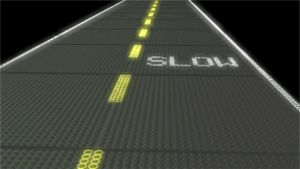 The top layer is made of glass that should supply the same traction as asphalt, is strong enough to handle whatever traffic can dish out and protect the electronic goodies below. Scott Brusaw, the originator of the Solar Roadways idea, estimates that if every street, driveway and parking lot was replaced with his invention, it would supply three times as much electricity as was used in the U.S. in 2003. This page was last modified 03:04, 29 August 2009.